Just caught a preview copy of Walk the Line: Extended Cut , courtesy of Twentieth Century Fox Home Entertainment. It is the Johnny Cash biopic directed by James Mangold (3:10 to Yuma ) which stars Joaquin Phoenix, as the Man in Black himself, and Reese Witherspoon, in her Oscar-winning performance, as June Carter-Cash. The pair vividly embody the roles of the country singing performers, singing all the songs themselves. Phoenix's smoldering intensity suits the haunted Cash perfectly. Witherspoon's own history as a child performer no doubt informed her portrayal of June, who had sung in the public eye since quite young. The new version is 17 minutes longer, and contains many new bonus features. Among these are five additional extended musical sequences that are very entertaining in and of themselves. The best of these is "Get Rhythm" performed by Joaquin Phoenix. These are joined by the three that were in the original 2-Disc Edition. And in addition to the four featurettes included in the original release, there are now three new ones: "Becoming Cash/Becoming Carter", "Sun Records and the Johnny Cash Sound", and "The Cash Legacy". Much of these seem to be outtakes from the first 2 disc edition's featurettes. Of these, the best is "The Cash Legacy" which features interviews and testimonials from some notable country and rock stars such as, Chris Isaak, Kid Rock, John Mellencamp and the Statler Brothers. The only criticism I have of these featurettes is the scarcity of footage containing the real Johnny Cash. It is disconcerting to keep hearing stories about Cash and have frequent cutaways to stills of Phoenix rather than Cash. It is especially unusual since this was a man who spent a lot of time in front of the camera, being an actor and the host of his own TV show in the early 70s. However, the stories told in these featurettes were very illuminating. If you are even a casual fan of Johnny Cash or the film, this new edition is worth upgrading to. But if you're a completist, keep the original as well. The theatrical cut is not included on the new edition. 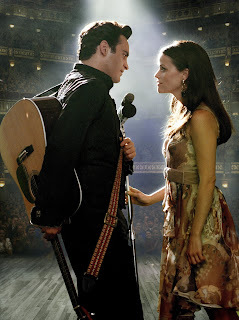 Walk the Line: Extended Cut, a 2-disc edition on standard DVD, will be available on 3/25.